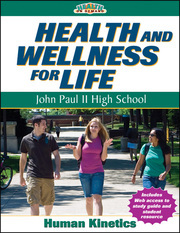 Health and Wellness for Life: John Paul II High School is the custom Health on Demand text for John Paul II High School. Professors—to learn more about customizing your own Health on Demand print text or eBook, visit www.HKHealthonDemand.com or contact your Higher Ed sales representative. Instructions for downloading and accessing the e-book will be provided once the order is complete.